The past few months have been incredibly exciting for me as an ophthalmologist here in Charleston, South Carolina. I’ve recently begun my role as President of the American Society for Cataract and Refractive Surgery (ASCRS) for the 2016–2017 year, and this new step has brought a number of wonderful opportunities along with it. I’ve enjoyed traveling to different states, meeting with some bright young residents in ophthalmology, and working with colleagues to create better programs for ASCRS and all of our ophthalmology patients. Primarily, I’ll spend much of my time working with colleagues and fellow leaders in ophthalmology. I’ll learn more about the studies they’re conducting, discuss opportunities for future research, and work together to provide the highest level of technology and opportunity for patients. I’ll also have the opportunity to spread awareness of Operation Sight. This organization is made up of more than 20 volunteer physicians working to bring cataract surgery to residents of South Carolina who lack insurance or the necessary financial resources to cover the cost. My presidency with ASCRS provides a rewarding opportunity to bring awareness of this organization to others who can help make a difference. From Washington, DC, to Jackson Hole, and several spots in between, this role with ASCRS has allowed me to travel to some of the best places our country has to offer and meet some wonderful people. My presidency began in New Orleans in May 2016, where I gave an address at the opening general session for the 42nd annual ASCRS/ASOA Symposium & Congress. 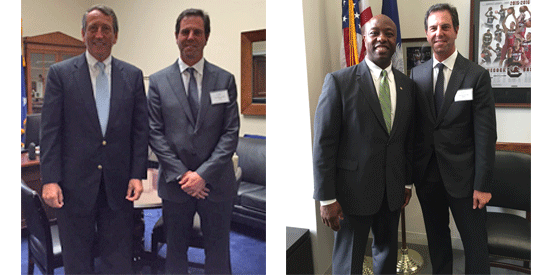 In July, I attended the Alliance of Specialty Medicine Fly-In in Washington, DC, where I met with Congressman Mark Sanford and Senator Tim Scott, both of South Carolina. Together we discussed the future of vision care for our state, and how we can work together to create legislation that benefits patients. The pictures at the top of the post are from that visit. 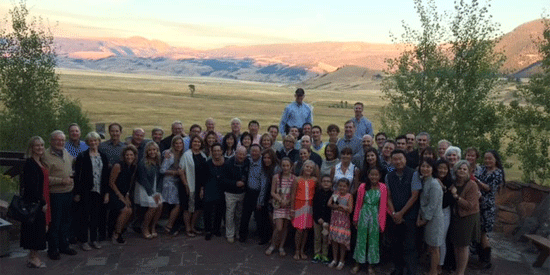 In August, I attended the ASCRS Executive Committee Retreat in beautiful Jackson Hole, Wyoming, where we discussed future projects for the organization and its members, and even had some fun with our families, as shown below. The travels will continue throughout the year, so stay tuned on Facebook for more updates and pictures. If you’d like to learn more about this exciting role with ASCRS, watch this interview with Low Country Live.